Villas in Fethiye for sale offer great diversity, from mountain view Fethiye houses to villas near sunny beaches of Calis and Oludeniz. Fethiye villas are perfect for those who wish to experience an outdoor lifestyle: strolling on the beach, walking in the hills or just soaking up the sun in an outdoor cafe. You can buy sunny homes in Fethiye Calis Beach, large villas in Ovacik and Hisaronu that overlook the mountains, or stately family villas in Uzumlu, where the low price of land means large houses are very affordable. Gocek villas cater towards the high-end buyer, with no expense spared on fittings, landscaping or design. Villas in Fethiye generally have private pools and landscaped gardens. Fethiye villas for sale are spacious and perfect for families. Today’s new build Fethiye houses are sleek, modern and open plan, with traditional Turkish touches such as mosaic tiling, marble floors or even a Turkish bath. 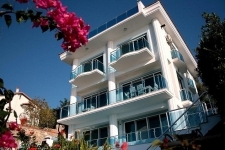 Villa prices in Fethiye start at around £70,000. This price will allow you to buy a small, older villa. The best villas in the area are priced from around £150,000, or £250,000. It is also possible to buy land in Fethiye, particularly Uzumlu or Ovacik, and design your own villa – at surprisingly little cost.